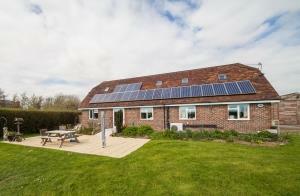 Chichester Self Catering07769 746113work Self-cateringNATURE'S ELEMENTS - A Country family apartment with a large mature garden, fully equipped for your holiday. Close to beaches, tourist attractions & Goodwood events etc. A ground floor apartment set in a mature garden with south facing aspect in Sidlesham, 6mins South of Chichester. The premises comprise two double/twin bedrooms and king size sofa-bed in the lounge space plus a cot. 2 toilets, one large shower. A large lounge / dining room / kitchen with adaptable furniture options allows for adaptability for guests. Large south-facing patio looks onto the garden, filled with birds and dark at night for star spotting! Plenty of car parking, on tarmac. Walkers, cyclists, birdwatchers and families are very welcome. The unit is very well equipped inside and out. Also suitable for discreet business meetings, with some executives being able to stay at the same time. Free Wi-Fi. Speak to Gayle for more details or to discuss your particular requirements. If you book a week's break as a SPECIAL OFFER you can also get 10% off the cost of various treatments at the Living Elements Clinic next door, depending on availability. You can book the house for your chosen dates but it won't be confirmed until I contact you directly, so make sure that I have ALL your contact details! Please find us and follow on Facebook, or on Twitter or Pinterest. We regularly publish ideas of places to go etc. LOTS of car parking for Classic cars, caravans and room for tents! Caravans and tents by prior arrangement. Full wheelchair access throughout. Shower has a 45mm step-up but has a shower stool and handrails. The wheelchair accessible door is a bit narrow but possible up a small ramp to a level platform. Small lip. Children welcome from any age. Complementary health care facilities available at the clinic on-site. eg Osteopathy, massage, Hopi Ear candling, from a consultant of over 27 years experience. Sharps bins, medical refuse bag disposal etc available at a small cost. Also, oxygen enhancement machines etc to hire. Call to discuss your requirements.